Find the value for items. 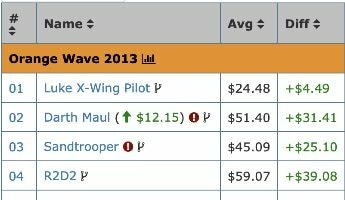 Updated daily for each of these categories: 6" Black Series, 3.75" Black Series, 3.75" Walmart, Vintage Collection, Archive Collection, Elite, Titanium, Wearables, Hallmark ornaments and classic Kenner Vintage Collection. Items shown with a or represent the biggest changes in price compared to the previous month. Hover over an item to see a picture of the item and click on an item's name to view more details. Items that are grayed out are repacks from previous releases. Items that are not released are listed on our Coming Soon page. A list of variations based upon figure paint, accessories or how it was packaged. The knockoff guide shows figures that are sold without Hasbro authorization. : These items marked with a caution symbol have potential knockoffs or reproductions. Purchase with caution. Cached on Wed 9:00:24 AM in 0.0015s.